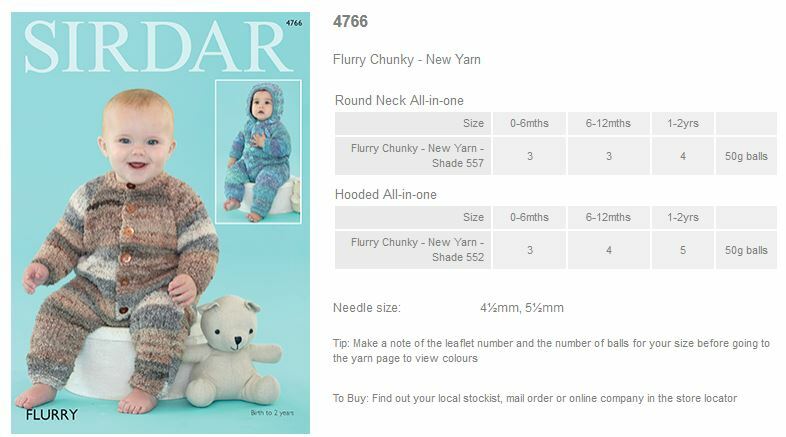 4766 - Round neck and Hooded All-in-ones using Flurry Chunky Leaflet with designs for Round neck and Hooded All-in-ones using Sirdar Flurry Chunky. 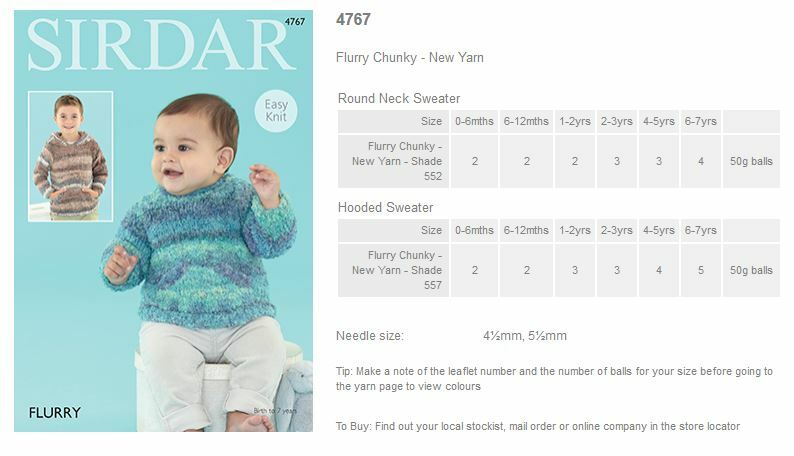 4767 - Round neck and Hooded sweaters using Flurry Chunky Leaflet with designs for Round neck and Hooded Sweaters using Sirdar Flurry Chunky. 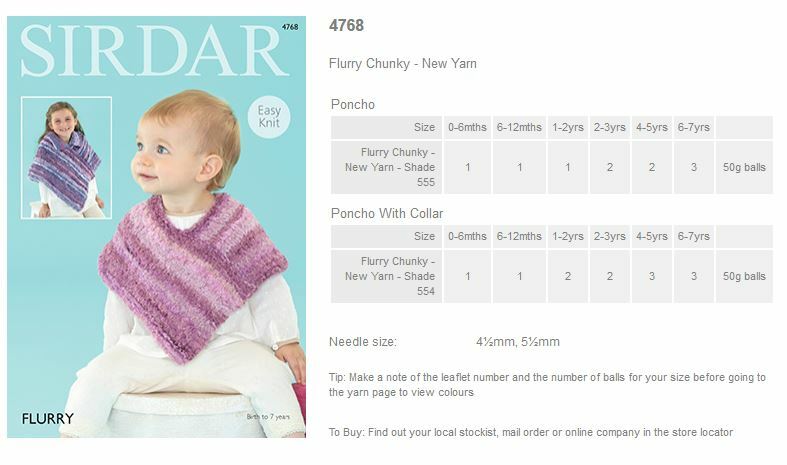 4768 - Poncho and Poncho with Collar using Flurry Chunky Leaflet with designs for a Poncho and Poncho with Collar using Sirdar Flurry Chunky. 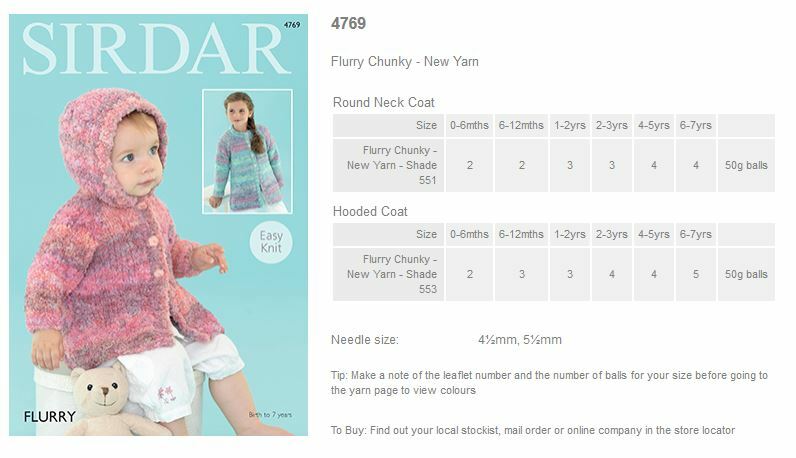 4769 - Round Neck Coat and Hooded Coat using Flurry Chunky Leaflet with designs for a Round Neck Coat and Hooded Coat using Sirdar Flurry Chunky. 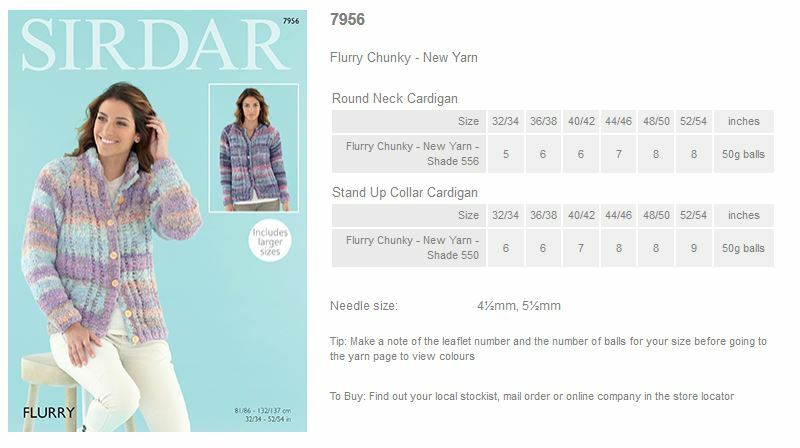 7956 - Round Neck Cardigan and Stand up Collar Cardigan using Flurry Chunky Leaflet with designs for a Round Neck Cardigan and Stand up Collar Cardigan using Sirdar Flurry Chunky. 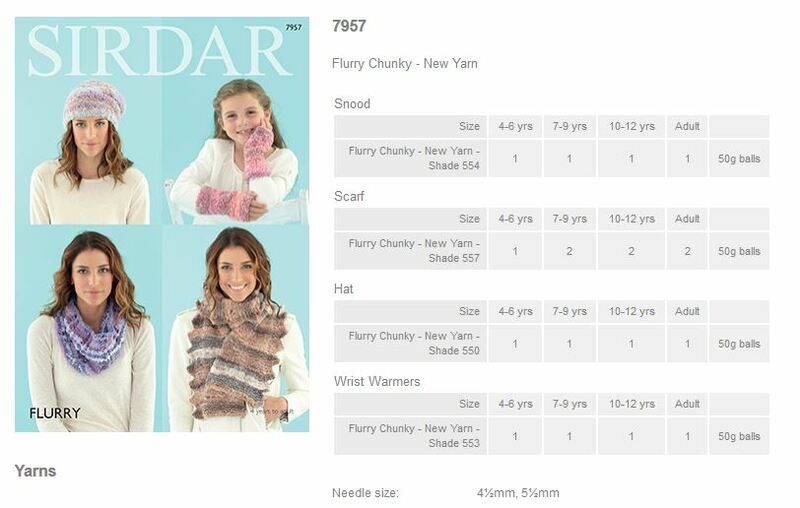 7957 - Snood, Scarf, Hat and Wrist Warmers using Flurry Chunky Leaflet with designs for a Snood, Scarf, Hat and Wrist Warmers using Sirdar Flurry Chunky. 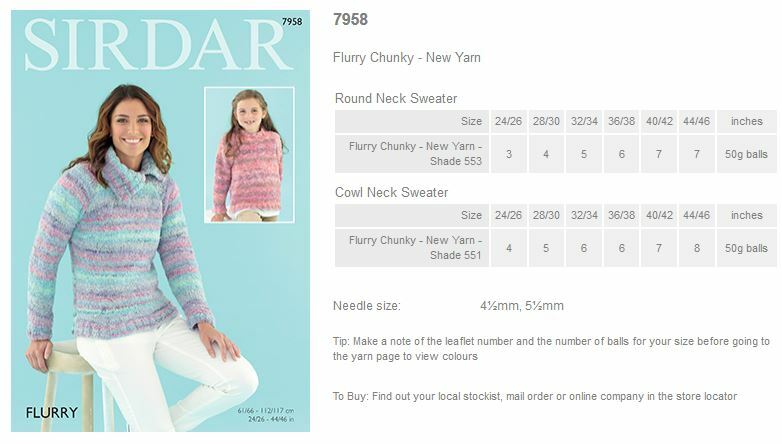 7958 - Round Neck Sweater and Cowl Neck Sweater using Flurry Chunky Leaflet with designs for a Round Neck Sweater and Cowl Neck Sweater using Sirdar Flurry Chunky. 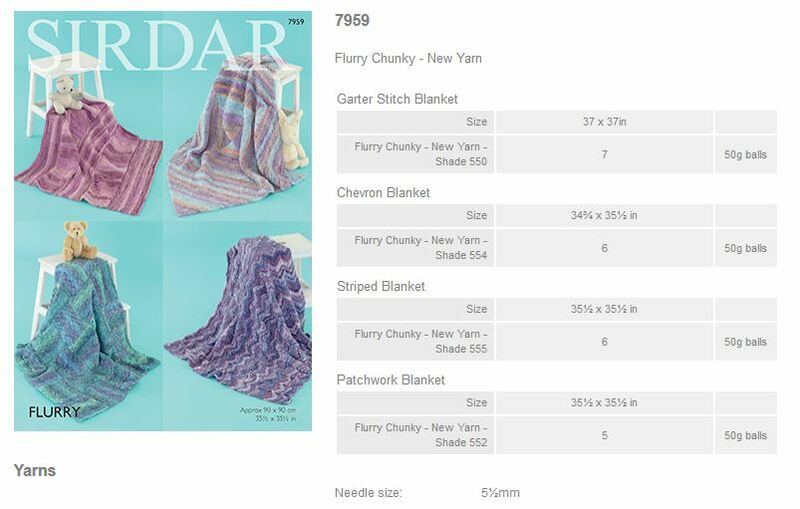 7959 - Garter Stitch, Chevron, Striped and Patchwork Blankets using Flurry Chunky Leaflet with designs for Garter Stitch, Chevron, Striped and Patchwork Blankets using Sirdar Flurry Chunky. 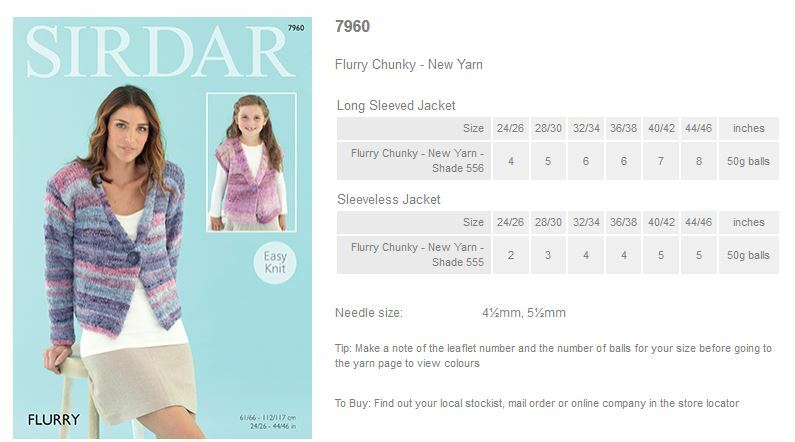 7960 - Long Sleeved Jacket and Sleeveless Jacket using Flurry Chunky Leaflet with designs for a Long Sleeved Jacket and Sleeveless Jacket using Sirdar Flurry Chunky. 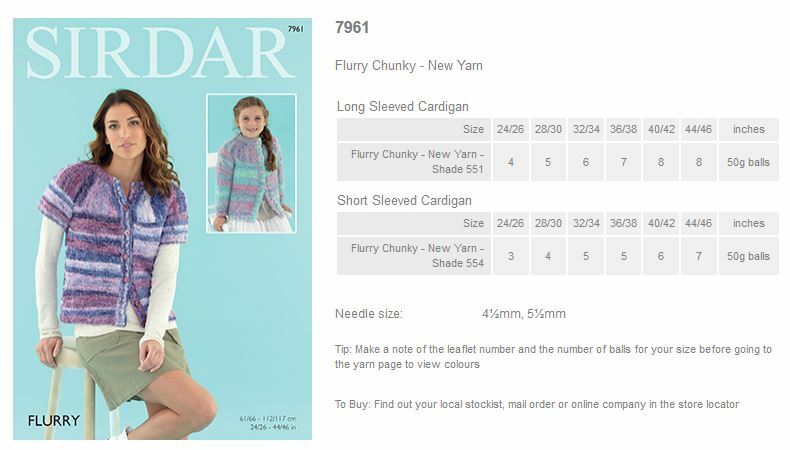 7961 - Long Sleeved Cardigan and Short Sleeved Cardigan using Flurry Chunky Leaflet with designs for a Long Sleeved Cardigan and Short Sleeved Cardigan using Sirdar Flurry Chunky.